PlayStation VR brings a whole new dimension to playing games by immersing you in all of these different worlds. However one of the more exciting things is when you can play these VR games together with other people and especially other people that show up in the same VR world that you are in. 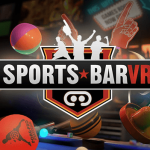 SportsBar VR from Cherry Pop Games is one of these such games where you are in a virtual bar and can be there with other players and friends. SportsBar VR supports up to six players in its virtual online bar. When it comes to control options you will need the PlayStation Move motion controllers to play this as the Dualshock 4 is not supported so keep that in mind. 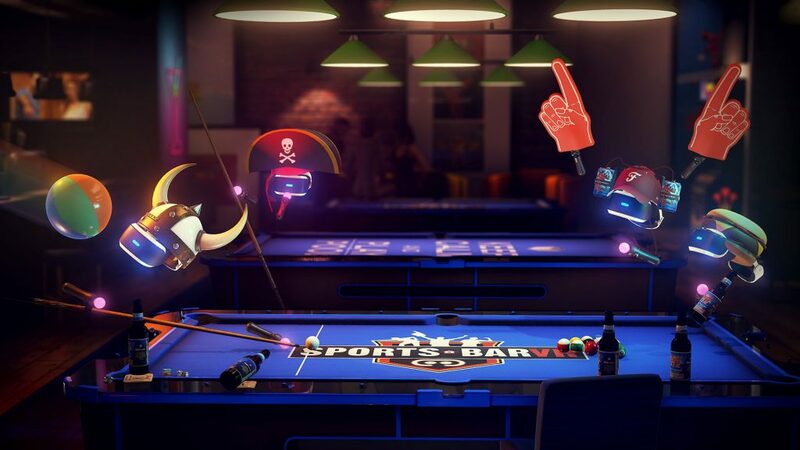 It makes sense when you take into account the kinds of things you’ll be doing in this bar such as playing pool, darts, air hockey, and more. 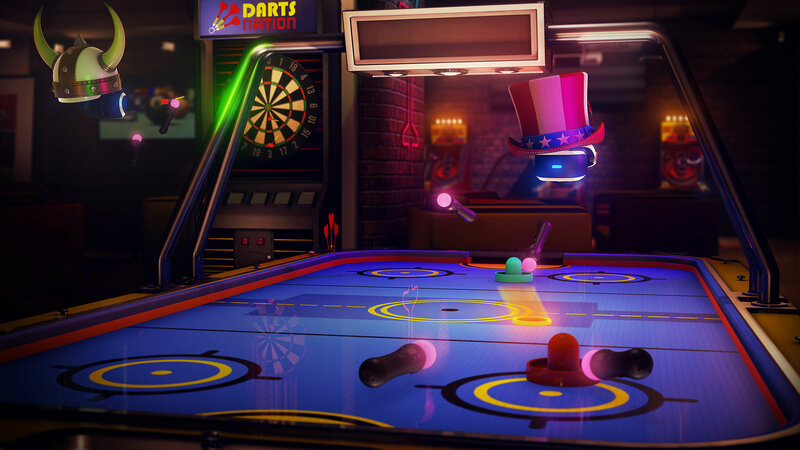 Playing pool feels almost like the real thing as you can use the Move controller as your cue and do things like lean closer to the ball to line up your shot perfectly. I’m not a big pool player in real life but I really like just how immersive it feels here. I will say that if you have played other pool games this isn’t no where near in depth and it doesn’t have some of the things that can assist you such as a line that shows you where the ball will go when you hit it. You can play this against AI if you want although their skill was a little too high and I never really felt like I had a chance against them. 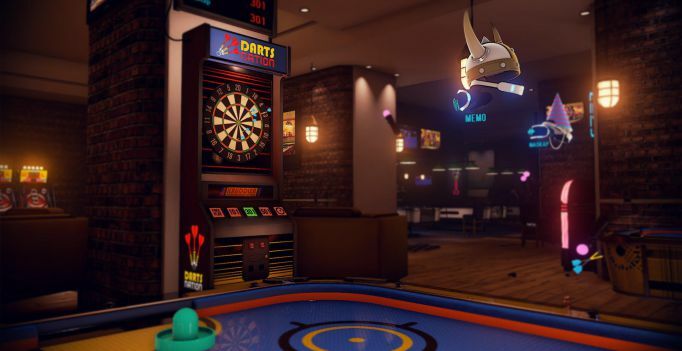 The other games aren’t as good as Darts has some tracking issues and a lot of times it seemed like it was just plain luck where my dart landed on the board. Air Hockey works well for the most part though and plays like you would expect. You can play all of these games with other players online instead of AI by setting up rooms yourself or looking for others that may be hosting. While the games are fun I found doing other crazy stuff around the bar to be more enjoyable. You can interact with pretty much anything you would think. You can pick up bottles and set them up on the bar or something and try to see who can knock more down. You can interfere with other players who may be playing pool or something to mess them up or throw bar stools at them. It’s just so much fun to do these crazy things with randoms or friends and is certainly one of the strengths of the game. Now while doing these random things is one of the strengths it also can cause one of the game’s weaknesses. If you cause too much mayhem the performance of the game can suffer as a result. Also the game seemed to disconnect me for seemingly no reason at times. A friend I played with also had the same thing happen to him so it seems like this is a common issue. Visually the bar looks good as long as you don’t focus on it too hard. Doing so you will notice that things can look blurry. 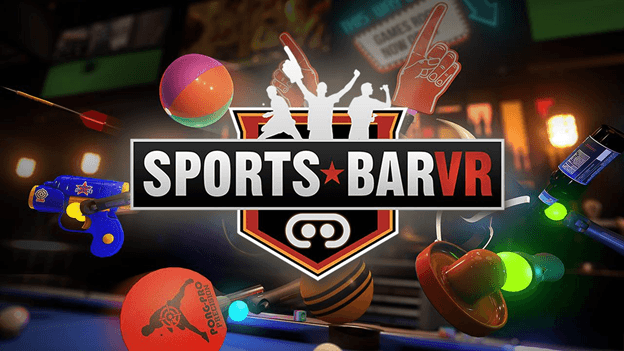 SportsBar VR has some good sound design that further helps immerse you in this virtual bar. You’ll hear the sound of glasses hitting the bar and listen to other people having conversations.